Capital middle-distance prospect Josh Kerr has scored his biggest victory to date by winning the US National Collegiate Indoor mile title at College Station, Texas. The 19-year-old Edinburgh AC member and George Watson’s FP defeated the American favourite and 5000m winner Edward Cheserek in the final in 4:03.22 after dipping under four minutes with a personal best time of 3:59.90 secs in his heat. 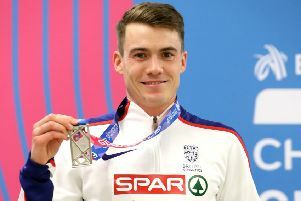 A winner through his junior track career – he captured the European under-20 1500 metres title two years ago – Kerr, a Freshman at the University of New Mexico at Albuquerque, has followed in the footsteps of another EAC star Chris O’Hare, who won the American college title in 2012 before going on to compete for Scotland in the 2014 Commonwealth Games and Britain in the Rio Olympics. Both men were coached by Edinburgh AC veteran Dave Campbell before going on to take up scholarships in the USA. Kerr, who is now coached by Joe Franklin and was only ranked sixth coming into the race, made a break with 420 metres left and the field were unable to catch him. “I’m pretty shocked at the moment but I knew how fit I was and I stuck to my race plan so it’s great the way it turned out – I’m a championship racer it’s what I do,” Kerr told the surprised American media reps.